Blue Mars Blog: Blue World Notes: What Do You Want Your Blue Mars Profile to Say About You? Blue World Notes: What Do You Want Your Blue Mars Profile to Say About You? The latest build of Blue Mars comes with a new profile section for you and your avatar, and every option in it is meant to be a conversation starter, when you mean another Martian: Likes and Dislikes, says, Favorite City in Blue Mars, and my favorite, a place to list what other virtual worlds you belong to -- I listed mine "Second Life (Hamlet Au)", so people will immediately know my SL avatar name. 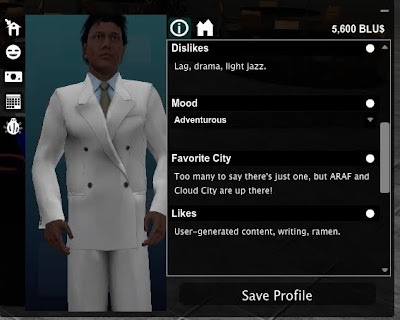 In my experience writing in Second Life, avatar profiles are the easiest way to find a connection point of common interest, when you meet another player. 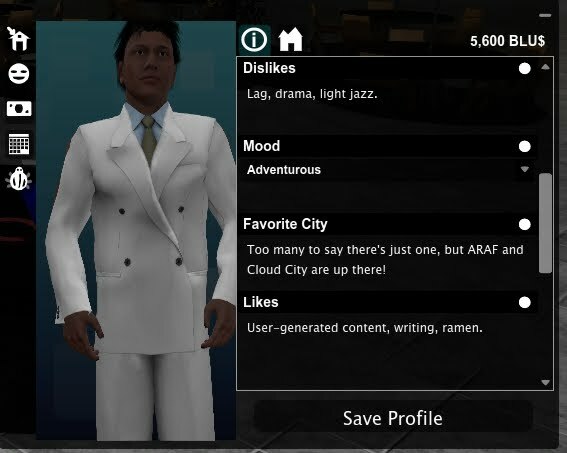 It's also a chance to express a lot about your real personality, from the safety of your avatar. If you're a longtime Blue Mars member, I hope you still take the time to fill it out, because I think we'll discover some interesting things about ourselves, and the growing Blue Mars userbase.